WHO DOESN'T LOVE FREE SHIPPING? We know you love free shipping. We all do. Retail customers practically demand it these days. Any good deal is only made better with free shipping. So we're on board with the trend. Let's do it! If you spend $99 or more, we'll ship your order within the contiguous United States for free. How awesome is that? Our base shipping service is typically FedEx Ground (for larger/heavier items) or USPS Priority Mail (for smaller/lighter items). Tracking information is always provided to the account email and there's no monkey-business with slow cheap'o services (no parcel post, first class mail, SmartPost, etc.). 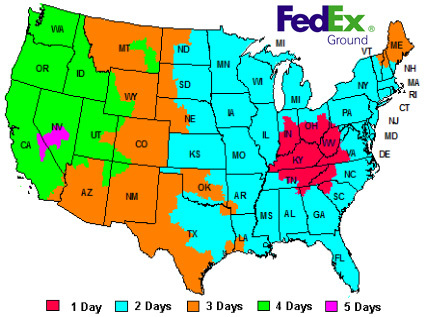 Standard free shipping orders will arrive either on the 2-3 day Priority Mail schedule or the FedEx Ground schedule (see map). Either way, your free shipping goodies will be zipped-out and arrive in a few days. Easy enough! WHAT ABOUT ALASKA AND HAWAII? Alaskans and Hawaiians are awesome people too. We think they should also get free shipping, but they don't. It's just too expensive to cover gratis, particularly on the larger bulk items like compound bow packages, crossbows, targets, etc. 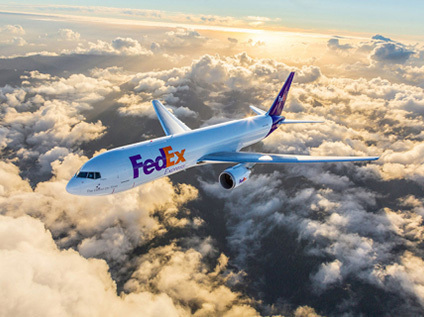 We admit, it would be a better world out there if those trucks and planes would actually move freight around the country for free, but they don't. Free isn't really free anyway. Shipping costs are all baked-into the magic of ecommerce, at least in the lower 48, but when shippers have to cross half an ocean or an entire continent, the costs of their services start to become real. We hate it, but the free shipping party just doesn't apply to Alaska and Hawaii. Yet in the spirit of goodwill, we have configured our online shipping calculators to provide some very affordable discounted rates to Alaska and Hawaii. We think you'll find them very competitive. HERE'S WHERE WE GET NERVOUS` Since the inception of our store, we have resisted offering express shipping. Our business model is service-based, meaning most of our items require some technical preparation. We don't just grab things from a bin, throw them in a box and smack down a shipping label. Most orders need some service work first (which takes a little time). So it's been a philosophical pickle for us. Offering "rush" shipping services literally means we need to hurry when an order comes in, and we never encourage our technicians to do a "rush job" on anything. Making a technician race the clock always seemed like a bad idea to us. That's how mistakes happen. As such, we have always tried to avoid selling our customers expedited services. Nonetheless, our customers want express! We continue to get repeated requests for expedited shipping services, and it's high time we delivered. So for 2017, we made some changes to our stocking program, shopping cart and service schedule to better handle expedited sales and order volume. So we're ready for you now. EXPEDITED ORDERS WILL NOW SHIP THE NEXT BUSINESS DAY (special order and drop-ship items excluded, of course). We know that might not be Amazon fast, but Amazon doesn't fletch arrows and hand-build custom compound bow outfits. We do. As far as we're concerned, that's lightning fast for service-based work from a real archery pro-shop (and it's still going to be done right). You want it fast? All right. Let's do it! HOW TO EXPEDITE YOUR ORDER` There's no fanfare or ceremony required. If you want your order shipped FedEx 2Day or FedEx Standard Overnight, simply choose that option at checkout if you're ordering online. If you're ordering by phone, ask for a quote and we'll make it happen that way. Be advised though, express shipping charges are generally non-refundable. If you return items to the store, express shipping charges are excluded from any refunds or account credits. Once that FedEx Express label is printed, it's a done deal.